Categories: bible, Catholic Church, Catholic Life, Fe, From the Pastor, Homilies, Reflections, sacraments, Video's | Tags: Abraham, bible, Eucharist, Father in Faith, God will supply, Isaac, Jesus, Love, Sacred Scripture, sacrifice, whole, wholeness, wood of the sacrifice, worship, yes | Permalink. Can’t make it to Morning Mass during the week? Come to the Tuesday evening Mass at 5:30pm in St Joseph Church. Hope to see you there! Are you hurting? Do you need quiet reflection time? Time alone with Jesus? 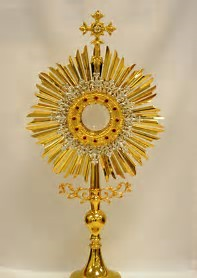 Join us for an hour of Eucharistic Adoration with a healing service on Friday, March 2, at 4:30pm in St Joseph Church. Categories: Announcements, Catholic Life, community, events, Fe | Tags: Adoration, Catholicism, Eucharist, God, Grace, healing, Jesus, peace, Prayer, worship | Permalink. God gives us many blessings in our worship. If we only knew. Categories: Audio Only, Fe, From the Pastor, Homilies | Tags: Abraham, Grace, Isaac, life, Liturgy, offering, sacrifice, suffering, worship | Permalink. Categories: Bulletin Articles, Dios, Espanol, Fe, From Fr Diego | Tags: Fr Diego Ospina | Permalink. Pro-life Catholics who wish Catholic Church leaders would step up and deny communion to leading politicians who support abortion are getting good news today. Categories: church teaching, Fe, News, Pro-Life | Tags: abortions, Babies, Catholic Church, Church, death, goodness, life, mass murder, murder, politics, Pro-Life, sins | Permalink. Categories: Dios, Fe, From the Pastor, Homilies, Video's | Tags: caffine, candy, chocolate, Coffee, contract, covenant, cros, exchange of persons, fasting, God, Grace, Inheritance, Jesus, lent, Relationship with God, sacrifice | Permalink.